MEN in khaki have played the central role in many a Hindi film. The cops are, at times, do-gooders, the kind who would brook nothing in their call of duty. Some such films bear testimony to the works of real-life cops. 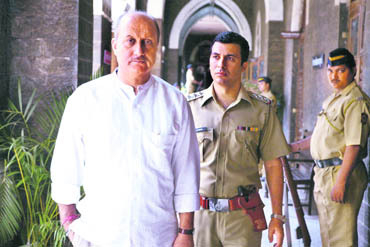 In Neeraj Pandey’s A Wednesday, Anupam Kher plays a police commissioner, Prakash Rathod. He narrates a case that is unregistered and has no mention in any police record. He gets a call demanding the release of four militants in lieu of information on bombs that a man has planted in various parts in Mumbai. At first, he suspects it to be a hoax but his doubts are dispelled when he finds a bomb planted in the police station opposite his headquarters. He sets up a team of his best men together and taps all resources to trace the caller. The film talks about choices people and authorities make during such testing times. Naseeruddin Shah plays the duplicitous tomato shopper who threatens the city with serial blasts. Kher as the beleaguered police commissioner is at his best. In Rajkumar Santoshi’s Khakee, DCP Anant Shrivastav (Amitabh Bachchan) is assigned the task of transferring a terrorist Iqbal Ansari (Atul Kulkarni) from Chandigarh to Mumbai. He forms a diverse group of police officers to aid him in a task that is dangerous and his last chance to prove his credentials. Joining him is Shekhar Sachdev (Akshay Kumar), a disillusioned corrupt police officer and Ashwani Gupta (Tusshar Kapoor), a naive new recruit out to make a difference. The transfer begins but seems to be thwarted at every stage by ex-cop turned baddie (Ajay Devgan). It soon becomes obvious that an insider is his accomplice ensuring he is always a step ahead of DCP Shrivastav. But the question that baffles all of them is just which one of them is trying to sabotage their mission. Films give us a peep into the working of the police department in some states. Prakash Jha’s Gangajal was inspired by the Bhagalpur blinding incident in Bihar. In the fictitious town of Tejpur, iniquity has stained the fabric of society. The state of affairs called for extreme purging by a messiah like Amit Kumar (Ajay Devgan), a cop who books no opposition to cleanse the system. In Govind Nihalani’s Dev, innocent lives become fodder for political expediency. The spark of terrorist violence set off by Farhan (Fardeen Khan) under the aegis of a politician Latif engulfs the city in its flames. Tej (Amitabh Bachchan), a police officer, transgresses beyond the boundaries of law to eliminate anti-national crime. Dev (Om Puri), Police Commissioner, is faced with moral compulsions to act. Dev and Tej are set on a path of dramatic collision. In John Mathew Mathan’s Sarfarosh, Ajay Singh Rathod (Aamir Khan) joins IPS to serve the nation. As the ACP and his team smash ring of cross-country terrorism, a vicious chain that links local brigands, shady businessmen, petty criminals and corrupt citizens comes to fore. The key figure in the racket is Gulfam Hassan (Naseeruddin Shah), a ghazal-singer from Pakistan, who carries on subversive activities under the cover of cultural exchange. Ajay is patriotic enough to forget his personal admiration for the singer and ruthlessly eliminates his country’s foes. Many films have been made to highlight the problems of honest police officers. In Ramesh Sippy’s Shakti, Dilip Kumar plays a righteous police officer, who doesn’t give in even when his only son Vijay (Amitabh Bachchan) is caught on the wrong side of law. In Shool, Manoj Bajpai is an honest and hard working police officer. He works within the rules and is like a square peg in a round hole in the prevailing system. He is transferred time and again because he doesn’t bend with the system. Govind Nihalani’s Ardh Satya brought to the fore the gangster-police-politician nexus. It was a story of a man fighting with oppression. From a dominating father who towers his life and the brutal system which threatened to abort his ideology. From being the epitome of an honest upright cop Anand Valanker (Om Puri), forced to protect an underworld don Rama Shetty (Sadashiv Amrapurker), he goes on to become a cynical one willing to break all rules to save his soul, his love and his ideas. A desperate Valankar, realising he has nothing more to lose, kills Shetty and surrenders. In Prakash Mehra’s Zanjeer, Vijay (Amitabh Bachchan), a cop is tormented by the recollections of his parents’ murder by an unknown killer. But once he identifies the man, he takes law in his hands. Vijay’s revenge on his parents’ murderer was a reflection of the anger of every young Indian who felt such real-life villains were stealing their opportunities and future. Whether it is Sanjay Dutt in Kurukshetra and Hrithik Roshan in Mission Kashmir, they all owe a great deal to Big B’s courageous portrayal of cop in anguishly in this landmark film. In V. Shantaram’s Do Aankhen Barah Haath (1957), Adinath — a Jail Superintendent believed that there is hope of goodness in every criminal. To put his ideas into practice, he took six condemned criminals to a desolate area and started a farming commune and succeeded. In the end, Adinath is trampled to death by a wild bull unleashed on him by the envious peasant in the neighbouring farm. Even in his absence, the reformed criminals continue with a virtuous life as they believe that their lost leader was observing their activities from heaven. With his film, V. Shantaram propounded the idea of reforming the prisoners. Prisons became reform houses after his film won international awards.